A/B testing subject lines is standard practice. Every email you send out should be A/B tested. Don’t work in a box –— ask your coworkers what they think of A and B versions. There are usually too many variables in your target audience to assume you know all of them. What works for one audience may not work for another, so you will have to test variations and keep a log of the open and click rates to avoid repeating yourself six months later. Here are some proven strategies to start you in the right direction. Subject length – The subject should be shorter than 50 characters. The reason for this is twofold: (1) The reader’s attention span is microscopic. Think in sound bites. 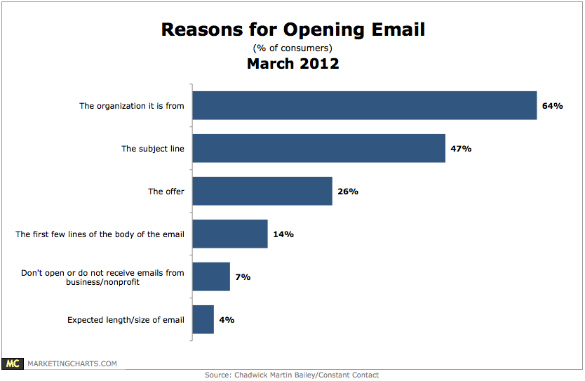 (2) You run the risk of getting the subject line cropped in email systems. Look at your email on your phone. There are exceptions. If your audience is very targeted and/or has a high open rate, then you can have a longer subject line; just keep the pertinent information in the first 50 characters. In the days of print the best headlines lines were three to five words and the limit was eight words. Capitalize – As with online text ads, you can get higher conversions with the first letter of each word capitalized. Capitalizing one word also works. Don’t pitch – Keep the subject to the point, direct, and not splashy or too promotional. Subject lines about coupons, discounts, and sales often don’t do well unless they are highly targeted. The subject line should tell what is in the email; it should not be a sales pitch about what is in the email or a pitch about the product or service. Ask a question – Stopping your reader to think about something that affects them is a classic sales technique. Think about the problems they are solving or obstacles they need to work around. Then try asking a question that gets their attention and, that gets them thinking about something that would benefit them. “From” line – The email should come directly from you or another human. “donotreply@…” or “sales@…” is a sure way to lose confidence and trust. It also does not build a personal connection. People prefer to buy from people, not machines. Company name – Having your company name in every email builds trust and brand identity and makes emails easily searchable for the reader. Humor – People love a good laugh or a play on words bringing levity to the day. Just make sure it is not offensive, or it can backfire. Testing on Twitter – Test your subject lines on Twitter. Send out tweets with different subject lines and see which ones get retweeted or mentioned more often. You can even ask which they like better. For blog posts you can post the blog and measure click through rate of the link on the tweet for each subject line.